What would you do if someone handed you $10,000? Would you go on a shopping spree, put it in a savings account, or contribute to the latest trendy investment? Before you decide, consider your options. In this article, you will get ideas on how to make the most of your $10,000. 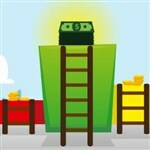 Deal of the Day: Get Up to $3,500 Cash Bonus with Ally Invest. See terms. Do you have a lot of personal debt? We don't normally think of paying debts down as investing. But it can just as profitable, and sometimes more, in the long run. Here's an example. You can obtain a 5% rate of return on your investment portfolio. But you have $5,000 in credit card debt and you pay 23% interest. If you invest your $10,000 rather than paying the $5,000 off, you actually lose 18% (= 23% - 5%). So paying off the credit card debt first is the smart move here. THEN you can invest the remaining funds using one of the strategies below. Rate of return is the profit off an investment. Banks write it as a percentage. If you make make $50 on a $1,000 investment, your rate of return equals 5%. You're in the 28% income tax bracket and pay a 5% mortgage interest rate. That means, you only pay 3.6% in mortgage interest after taxes (= 5% x (1 - .28)). If you find an investment with a rate of return higher than 3.6%, then it makes sense to invest rather than pay down your mortgage. Once you pay down your debts, we recommend you focus on your retirement plans. First of all, if you don't have a 401(k), you should. This is especially important if your employer matches contributions. Check with the HR department to see what percentage your company matches. Make sure to contribute at least that amount—otherwise, you're turning down free money. 401k Company Match: Some employer's VEST their contribution to your 401k. This means you'll likely have to work a certain amount of time to receive a percentage (or the whole amount) of their match. But you'll ALWAYS get 100% of your contribution, regardless of how long you stay with the company. Even if your company doesn't match, consider contributing the maximum amount. It'll give your retirement savings a boost AND lower your taxable income. If you've maxed out your 401(k) contributions, you can put up to $5,500 ($6,500 a year for those 50 or older) post-tax in a Roth IRA annually. And the best part is, you won't be taxed when you withdraw this money after retirement. If you are self-employed, you can contribute up to $5,500 a year ($6,500 a year for those 50 or older) and that amount may be tax-deductible. Depending on your situation, you may have other retirement savings options when self-employed. These include: starting a 401k or a SEP (Simplified Employee Pension) IRA. Check with a tax professional to review your options. Now that your financial house is in order, read our list of the best ways to invest $10,000. You've set goals and timeframes, lowered your debt and, funded the proper retirement accounts. Now it's time to try making some money. Here are some great options for investing $10,000, starting with the ones that can offer great returns—but also some risk. Market risk: These are things you have no control over. If the overall financial market suffers, even diversification (basically having a balance of investments in your portfolio) doesn't eliminate risk. Business risk: If you invest in stocks, a company's corporate decision could affect your investment one way or the other. If the market perceives decision as bad, the stock price could plummet. Political risk: Political events also may affect the market. Think about how the public reacts to major government events and decisions. These reactions can affect your investments, both foreign AND domestic. Liquidity risk: The time and cost involved in converting an investment into cash contributes to its risk. The more time or cost involved, the higher the liquidity risk. Concentration risk: The less diversified your portfolio, the higher your concentration risk. If you only hold two stocks and one of those plummets, your portfolio will take a big hit. But that's less likely if it's one plummeting stock out of 20. Remember the greater the possible reward, the higher the risk. When you take a loss, you'll need to decide whether to pull your investment or wait it out in hopes of reaping a higher return before too long. You don't need a stockbroker to trade stocks. Today, you can use an online brokerage account, such as E*TRADE, among many others. Choose a company offering a simple interface and resources for new investors. 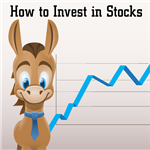 Read How to Invest in Stocks for Beginners for more. Once you choose an online broker, create an account. As a customer, you may have access to more resources. Take your time to learn about each company. Read news, stock performance histories, and professional forecasts. Then choose one or two stocks to start your investment. Hold off on investing a lot until you have a good handle on the process. When you have a handle on investing in stocks, create a plan. Set the amount you want to invest. Also, know the threshold for the amount you can lose. This way you can remove the emotion from the process. Seeing your money plummet can force you to make a hasty decision. Have a plan in place and stick to it. Mutual funds and ETFs offer diversification. Rather than investing in one company as with stocks, they diversify between stocks, bonds, and other short-term investments. They can invest in many securities all at once. First, choose a brokerage. Charles Schwab, Vanguard, and Fidelity are among some of the most popular. 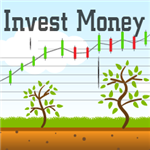 See How to Invest Money for more detail. Longer-term goals, such as retirement, do well with index funds. These funds mimic a specific index, such as the S&P 500. They offer diversification and a long-term investment strategy. The returns on index funds closely mimic market returns. They require very little management and often have lower fees. If you already have an emergency fund, have maximized contributions to retirement and have no debt, then you should consider investing the money in a broad-based market index fund, such as a S&P 500 ETF or a Total Stock Market fund. Choose the fund with the lowest expense ratio, as minimizing costs is the key to maximizing net returns. Bank CDs offer lower risk, but also lower returns. Did You Know: The 20-year return on mutual funds averages 4.67%. Buying a bond is basically just buying debt. You can invest in them much like you would stocks (for the differences between stocks and bonds, read our guide ). Bonds also receive different ratings based on the credit of the issuer. Typically, you can calculate your return BEFORE you purchase a bond based on rate and period of maturity. But as with any investments, bonds do carry some risk, For example, when interest rates rise, bond prices fall. This means that if you choose to sell a bond before its maturity date, you could make less than the price you paid for it. Bonds generally must be purchased through a broker though T-bonds can be bought directly from the government. If you think $10,000 isn't enough for a financial advisor to take you on as a client, consider a robo advisor. This automated advisor - really, a software program - does the work for you. See Why Consider a Robo-Advisor for more information. Betterment is one the most popular robo-advisors with low fees and no account minimum. You can get automated portfolio management and access to financial experts. Tip: Robo-advisors are not people. You won't get personal advice or even a person to speak to in some cases. If you prefer conversations with a person, you can pay for a higher tier with a company like Betterment. This gives you access to a professional advisor along with basic services. If you prefer a little more control over what you invest in, consider Motif. As the investor, you create your own mutual fund. You also have the option to invest in someone else's motif. These are different from pooled funds, like mutual funds. With Motif, you own the stocks within the investment, but you determine the dollar amount invested. You don't buy a specific number of shares. As a bonus, you don't pay administrative or management fees. Motif is a hybrid of the robo advisor and a DIY investment strategy. You control certain factors, such as the industries you want to invest in, and Motif does the rest. If you want to give real estate investing a try, Fundrise is a smart idea. Users can invest in private real estate without dealing with tenants, maintenance repairs and other problems in traditional rental estate. If you are tired of the 9-to-5 grind and want to answer to no one but yourself, this could be your chance. But you'll need a great idea—and a solid business plan—before seriously considering starting your own business. Unless you have a lot of experience in the industry, make sure you get the help necessary to help you succeed. We recommend visiting the Small Business Administration's website before starting. They offer many resources and steps for beginners and even the experienced business owner. Peer-to-peer lending is a somewhat new method of investing. It's a good choice for investors who don't want to deal with a financial institution. Instead, you become the lender. By joining a P2P platform, you can connect with borrowers all over the world. The benefits of P2P lending are the high rate of return and lower risk. As an investor, you may pay an origination fee, closing fee, or an annual fee. Lending Club and Prosper are the top two P2P platforms operating today. They work as the intermediary between you and the borrower. They fund the loans (after you pay them), collect payments, and help with litigation should the borrower default. You can diversify your risk by lending money to multiple borrowers at once. Your $10,000 could fund many borrowers with low borrowing needs. Keep reading for some low (or no) risk investment ideas you don't want to miss. If you are looking for a risk-free investment with decent returns, look at CDs. We recommend using an online bank rather than a traditional bank. They tend to offer higher rates. With CDs, the longer you invest the money, the higher the APY (Annual Percentage Yield). Also, the higher the account minimum required, usually the higher the APY. Today, you may see a rate of return between 1% and 1.5% on 1-year CDs, but the rates can go up to as much as 2.25% for longer-term products. Read: Check out our list of top CD rates. When we talk about savings accounts, we don't mean the account at your local bank where you have a checking account. They probably offer measly returns. We mean online savings accounts where you could obtain rates as much as 10 times higher than your local bank. You should consider a few things before you invest. Make sure the FDIC insures the bank. Also, read the fine print regarding withdrawals. Make sure you have access to your money when you need it. Some banks may charge fees for withdrawals. Check for required account minimums too. If you prefer a debit card, look for banks that offer this service. or find other ways to better yourself. No matter which avenue you take, you'll gain new knowledge and skills. You can then take these skills out into the world and make money. They may provide new opportunities for employment, especially if you add a designation to your title. Certain designations offer you the opportunity to be listed in online directories, such as a CPA. This may result in more business and earnings for you. It's also a great way to enter a new industry. The money can help you make smarter decisions, try new opportunities, and make more money. Is it worth going back to school? People with bachelor's degrees will earn an average of $61,000 a year over the course of their career, according to a 2015 study by Georgetown University. That number jumps to $78,000 for those with master's degrees. Salaries vary significantly by industry, however. Fulfillment by Amazon is like other selling sites, but easier. You supply the items you sell, but you ship them to Amazon. You market the products on Amazon's website. Once sold, Amazon ships the items for you. It's the simplest form of selling products online. You don't need coding, graphic design, or social media experience for success. You'll have access to Amazon's large marketplace of buyers, and you only do a fraction of the work involved with other selling sites. It almost provides immediate gratification. You can sell new or used items. You can also choose between the individual account (a free account) and the professional account ($39.99 per month). Your home may be your largest investment. If it's outdated or needs a facelift, certain improvements can have a direct impact on your home's value. You don't need to make drastic changes to see a large improvement in value. In fact, major bathroom and kitchen remodels often don't have a large return on investment. New siding, new roof, and new windows often pay off better. Small changes within the kitchen or bathroom, such as the addition of granite countertops, often pay off. Another change with a large ROI is updating the home's curb appeal. You may even get bonus points for energy efficient changes you make. Depending on the tax year, you may get a tax break for the new changes made. Did you know? The average home appreciates between 3-5% a year in the United States though this figure varies based on a number of factors including your local market. Home improvements can add even more value to your property. If you have a passion for the DIY, consider starting a blog. Many people use this as a side gig. They write when they have time and become affiliate partners with businesses to make money. Starting a blog won't cost $10,000, but having some capital helps. For starters, you can further your education before starting. Take classes on starting a blog or get in-depth training in your chosen industry. The more you have to talk about, the better, so education helps. You'll also need money for the domain name, platform, and website hosting. You may also need to upgrade your computer equipment, camera, microphone, and video equipment. If writing isn't your thing, but you love to talk, consider starting a podcast. It works like a blog, but you don't host a website. You will need a host for your podcast, though. When you first start, your free website may offer enough support. As you gain more followers, you may need greater capabilities. Too many listeners can cause glitches in your podcast. This could be bad for your following. Today, SoundCloud and Amazon S3 top the charts in podcast hosting. No matter which you choose, read the fine print. Some services, including Amazon S3, charge a base fee, but it increases as your following increases. Just like a blog, though, you can monetize your podcast. You can sell advertising time within the podcast or let a company advertise on your host page. This can help you afford the podcast hosting fees. Before that money burns a hole in your pocket, consider your goals and timeframe. Are you going to need to use it anytime soon? If so, avoid putting it somewhere that's too risky, especially if you might need it in the short-term. Read on to learn what you should consider. What do you dream of doing with your $10,000? Will it fund a luxurious vacation, help you retire, or buy a house? First, categorize your goals as being long-term (retirement) or short-term (vacation). These timelines dictate the level of risk you may want to take. Here's a basic rule: The shorter the timeframe, the less risk you can take. The longer the timeframe, the more risk you may be able to handle. Riskier investments tend to have more ups and downs. Do you have time to ride them out - and perhaps get a greater return? It's a key question for every investment you make. Risk: The chances you take with your money. It is the level of variability of your investments, which may go up or down. It could hurt or help your financial situation. Your personality helps determine your risk level too. If you worry a lot, less-risky investments may be better. Obsessing over your investments isn't healthy. They may cause you to make rash decisions, affecting your finances. If, on the other hand, you don't worry much, more risk may work if you're okay with potential losses. Knowing you are in it for the long run may help. The best thing for most investors is to invest in a low-fee, broadly diversified, stock market index fund. Buying an individual stock is subject to tremendous risk. A mutual fund or ETF diversifies, and the volatility of that investment will be much less than that of the average single stock. A low-fee fund is essential, as that means more of the investor's hard earned cash is being put to work. Just as stock market returns compound over time, the deleterious effects of high fees also compound over time. One good choice is the Vanguard Total Stock Market Index Fund ETF (Ticker symbol VTI). The fund is designed to track the performance of the Center for Security Pricing (CRSP) US Total Market Index, which represents approximately 100% of the investable U.S. stock market and includes large-, mid-, small-, and micro-cap stocks regularly traded on the New York Stock Exchange and NASDAQ. Total annual fund operating expenses are a miniscule 0.04%. So, for a $1,000 investment, $999.60 would be put to work and only $0.40 would go to fees. And there is no minimum investment required. In a perfect world, a balanced portfolio works best. It gives you a mix of risky and non-risky investments. When risky investments lose money, they can often be offset by more stable investments over time. When to Invest: If you've got a big chunk of money gathering dust (and very little interest) in a traditional savings account, then investing in stocks or mutual funds may be right for you. But don't risk losing money you may need in the short term. Consider creating a rainy day fund first to cover unexpected expenses, including car repairs, illnesses or even loss of a job. Or invest that money in a risk-free option like a high-yield savings account or CD. Most people investing $10,000 don't hire a financial advisor. The fees alone would eat away your profits. Instead, they handle their own investments. Even without a financial advisor, though, you may pay fees. Look closely at the fine print before choosing an investment. Just as you might comparison shop for large ticket items, you should do the same for an investment firm. Ask about their fees. You may even be able to negotiate some of them. Keep in mind, though, if you decide to change brokerage firms, you may face tax consequences. For more information on fees, see How to Invest Money. If you are unsure about a brokerage firm, a great tool to use is BrokerCheck. They provide information about a broker's background, experience, and prior complaints. Evaluate your situation: Do you have a retirement account? Do you contribute the maximum amount to it? Are you in debt? Is your interest rate higher than any rate of return you could get? Do you understand mutual funds, robo advisors, and stocks? Knowing your situation will help you make a more informed decision. Many investment options have small minimum requirements and low fees. Shop around and consider your options to find the best way to grow your $10,000 investment. Leave a comment about Best Ways to Invest $10,000?